the part of the plant we can’t see, but that puts the sap into the tree’s veins. the world that goes around in cycles; the world where we die. The other world is what makes this world work. is by feeding it with our beauty. Over the last few weeks, I’ve written about soul work—the deep work of reclaiming our true selves. When Saturn entered Scorpio in October, this kind of work began to resonate for many of us. This week, a New Moon Solar Eclipse in Scorpio reaffirms this desire to look at what has been hidden within for a long time. Often when we think of what hides within us, the first reaction is fear. For many reasons, we may feel that we need to keep some part of ourselves secret. We aren’t ready to claim everything in the shadows of self. This is normal and helps us to cope with a complex world. However, at certain points in life, the soul asks us to unpack those fears and retrieve what lies deeper inside. We have that opportunity now to reconnect with the hidden world and claim the treasures residing there. Imagine as poet and shaman Martin Prechtel says, that there is an invisible world that feeds this world. At times that other world seems very distant from our tangible world. At other times, like right now, these worlds come so close they kiss. We have the opportunity to tend the relationship between the tangible world and the other world at this moment. This work of feeding the unseen world is not just about the development of our individual souls. It also is about ensuring the survival of the tangible world we share. We need a healthy flow between these worlds. We feed the unseen and the unseen feeds us. For this next lunar cycle I am inviting intention around relationship with the unseen world. And if Martin Prechtel is right, and I believe he is, then the way I feed that relationship is through beauty. Sunday, November 11. Breathing in. Breathing out. This lunar cycle, which began on October 15,* wanes into darkness. A lot has happened this last month. Each of us has been called upon to act for and learn about balance during this cycle. These last two days of the lunar cycle calls for release and rest. No need to push ourselves out into the world. Even if you need to be busy today, it is good to keep that connection open to the inner world. Neptune is stationary, which means that the god of ocean is speaking forcibly to us. The message is heard best when we dream. Considering that Mercury exactly squared Neptune on the day Sandy hit the east coast, and that due to retrograde motion Mercury will exactly square Neptune two more times, I expect that one of Neptune’s messages is about climate change. How are the oceans changing? What does it mean that the ice caps are melting? Ask Neptune what he wants you to know. Notice waves and currents of emotion. Monday, November 12. On the way to the Solar Eclipse tomorrow, the Moon has intimate conversations with Neptune, Saturn, and Pluto today. These three planets don’t play around. The amount we can open and empty today may reflect how well we may be able to use this next lunar cycle to tend our relationship to the unseen world. It is good to practice self-compassion. November 13—New Moon (Solar Eclipse): Dreaming. Give yourself time to listen before setting intention this lunar cycle. Each phase of the Moon lasts about three and a half days. For this cycle, it may be more important to wait and listen to the messages from the unseen world before you decide what your own work will be. Darkness, receptivity, and commitment are big themes in the chart for this New Moon. There is a solar eclipse today. The light suddenly goes out and then comes back. We don’t know where this potentially unsettling change leads. Eclipses are unpredictable but can be very helpful in moving us forward on the right path. Anyone with planets or important points around 21 degrees of Scorpio will most likely feel this eclipse more powerfully. That same degree of other Fixed signs (Taurus, Leo, and Aquarius) are more susceptible too. We might feel the shock of darkness. But this shock helps us to open to connection with the unseen world. Mercury is retrograde and exactly squares Neptune today. (See Sunday, November 11 forecast.) This aspect between these two planets may be the signature aspect of Mercury’s retrograde journey for this time. We reflect (a good thing to do during Mercury retrograde) on the experiences of the first square when the hurricane struck. This storm will have significance for some time. We go deeper into thinking about it now. Other sensitive degrees for this entire lunar month are between 4 degrees and 7 degrees of any sign. Every sign at these degrees will be impacted by Saturn, Uranus, Chiron, and Pluto. The faster moving personal planets play round these degrees too this month to create an unsettled time. A lot is going on. If you have any natal planets at these degrees, you most likely will feel this even more. Last lunar month’s work with balance may be very helpful in staying centered while it seems that every god wants to talk to us at once. Wednesday, November 14. Chiron stations direct today. Before a planet appears to change direction from Earth’s viewpoint, it stays put for a few days. While this happens, the planet’s energy is more focused. We have an opportunity to learn more about Chiron. Astrologer, Melanie Reinhart , writes beautifully about Chiron in Pisces: “The way of Chiron-Neptune is to experience our personal feelings deeply enough, with sufficient steady abiding, so that they open out into the realization that these stormy waves on the sea of our little lives are the very same feelings which, at this very moment, countless millions of others may also be feeling. For the sea represents something of our common humanity, beyond dogma, belief, or even cosmology. It is the felt sense of inhabiting a sacred world. No ‘proof’ is needed, no rational argument is adequate. This is the world of the mystic, where the presence of the Divine is a felt experience that needs no explanation.” The “sea of our common humanity” is sending a signal: Open to deeper connection with the unseen world. Whatever we feel, we must remember that we are not alone. Thursday, November 15. 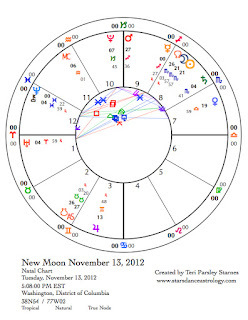 The last day of this New Moon phase may be dissonant and paradoxical. We might get impatient again. Whenever Mercury is retrograde, impatience usually leads to mistakes and miscommunications. Remember the cord of connection to soul. Part of us wants to maintain that quiet intensity a little while longer, another part wants to get on with change and action. If we don’t recognize these two parts within, we may encounter others who will play one of these roles for us. What’s the rush? Respect your own rhythm. November 16—Crescent Moon: Beginning. I love it when I get to put real foundations under my mystical reveries. Just how do I serve my intention of feeding the unseen world with beauty? Today, we begin to experiment with how to manifest soul desire. How exciting! When Saturn entered Scorpio it began a significant exchange with Pluto. These two planets are in each other’s home signs. Pluto is co-ruler of Scorpio (with Mars) and Saturn rules Capricorn. Since Pluto is in Capricorn and Saturn is in Scorpio, astrologers say they are in mutual reception. They both become stronger in their use of these signs. Capricorn and Saturn are all about real world manifestation. Pluto and Scorpio are all about hidden soul work. We get to manifest soul with the help of these planets. There is extra oomph coming today too from the ingress of Mars into Capricorn. Now, both co-rulers of Scorpio are in mutual reception to Saturn. Get out of the way. The Moon in Capricorn helps this sense of beginning an important journey. The path may be long, but dare to set tangible goals for yourself. We get a lot of support. Remember the messages from Chiron on the 14th? That may have been a day of expanded compassion or a realization of common experience. Saturn trines Chiron making it a good time to base your actions in compassion and your compassion in action. Saturday, November 17. The Sun and retrograde Mercury meet today in their inferior conjunction. This meeting represents the core of this retrograde cycle. The Sun illuminates the messages of Mercury at 26 degrees of Scorpio. Honor this transit by sending beauty to the unseen world. Mercury, known as Hermes too, is the psychopomp, the messenger between the worlds of the living and the dead. What an auspicious moment to send your own promise that you will continue to feed those in that world. 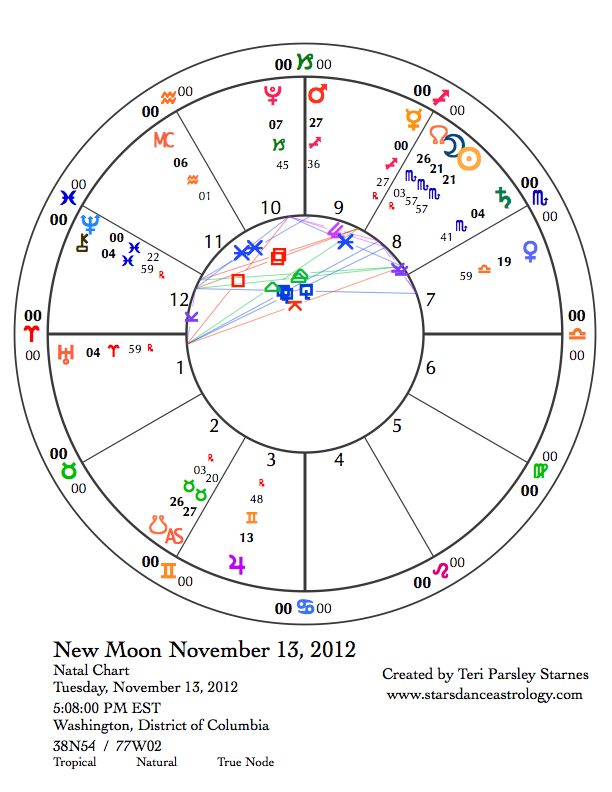 * Read the forecast for October 15 to follow along with this lunar cycle. Very good information, new to me, exciting.